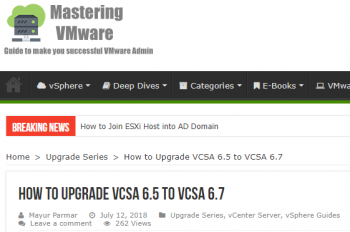 As always, you need to upgrade VCSA to 6.7 before you upgrade your ESXi host(s) to 6.7, see also Eric Siebert's Important information to know before upgrading to vSphere 6.7 and Brandon Lee's VMware vSphere ESXi 6.7 New Features Installing and Upgrading. 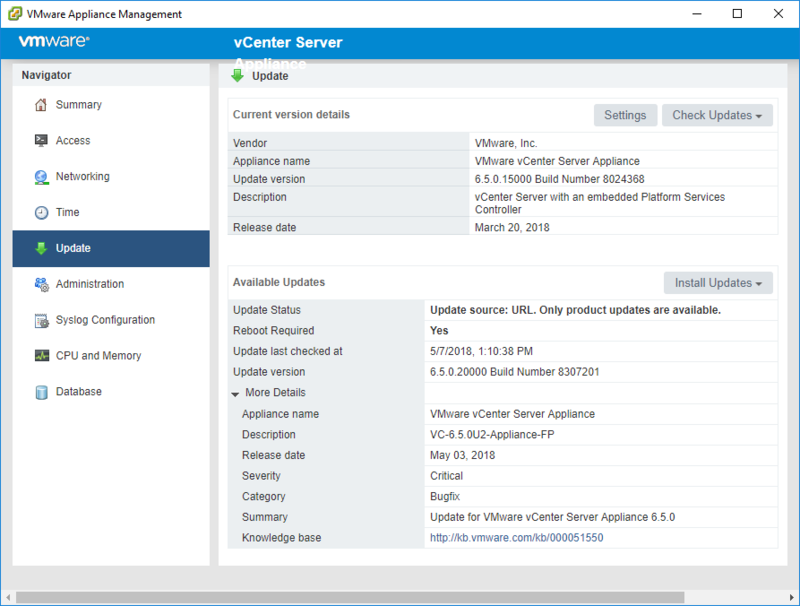 The vSphere Update Manager, vSphere Client, and vSphere Web Client are packaged with vCenter Server. 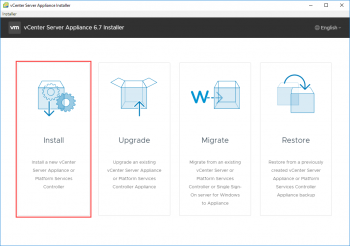 To view a list of processors, storage devices, SAN arrays, and I/O devices that are compatible with vSphere 6.7, use the ESXi 6.7 information in the VMware Compatibility Guide. See the vSphere 6.7 GA Release Notes for information on unsupported CPU's in vSphere 6.7. 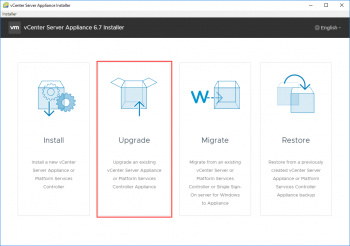 You'll also need to carefully read VMware Docs vCenter Server Upgrade. I'm still working on what will be available via VAMI CD ROM ISO mounting and/or URL download methods, stay tuned. 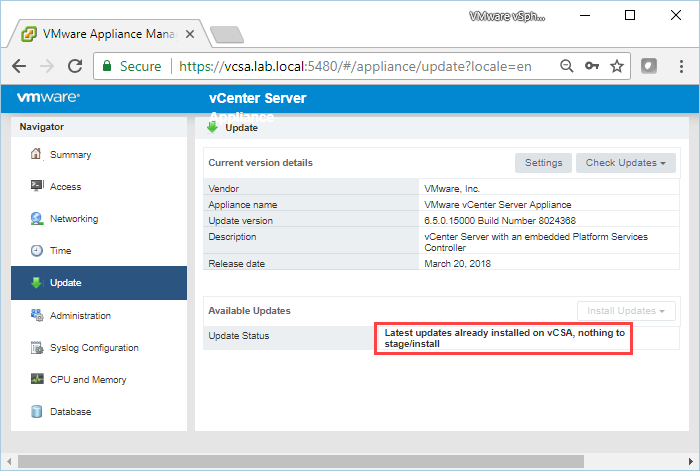 This is a fresh install, where no VCSA existed before. 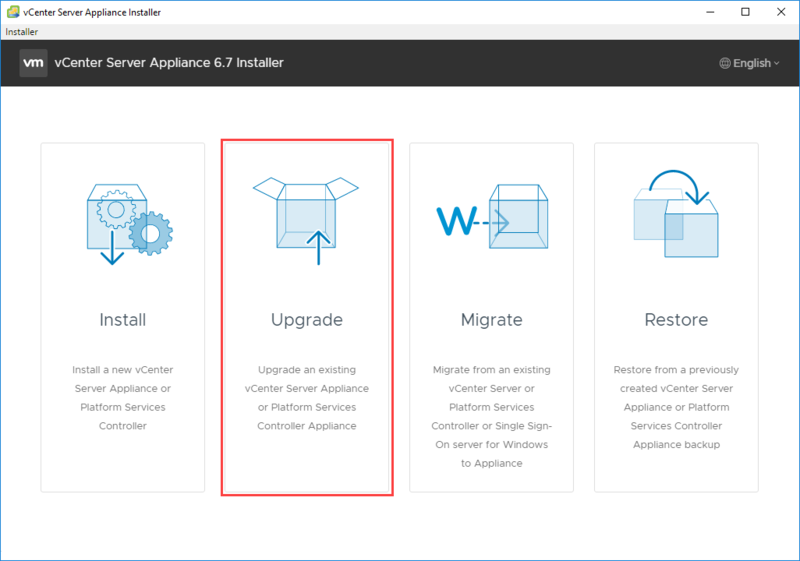 That type of install is out of scope for this easy update article. For environments with any VCSA 6.0 or VCSA 6.5 version, and a functioning connection to the internet. I don't yet have video of an upgrade to 6.7 prepared, meanwhile, you can see 6.5 VAMI update video below. 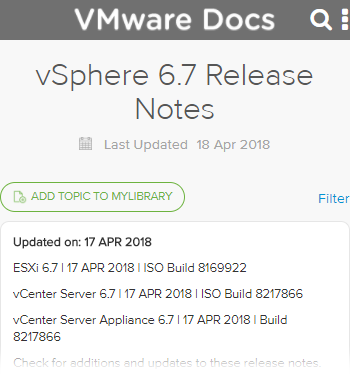 On Apr 27 2018, trying to get from 6.5 to 6.7 directly from VAMI's updater doesn't work, it seems you'll need to use the ISO/installer method instead. For 6.5 to later patches, you simply clicked on 'Update' along the left edge of DCUI, then clicked on 'Check Updates', then 'Check Repository', then under Available Updates, clicked on 'Install Updates' then choose 'Install All Updates', accept the EULA, and when it's done downloading and upgrading, you were prompted to reboot the VCSA appliance. 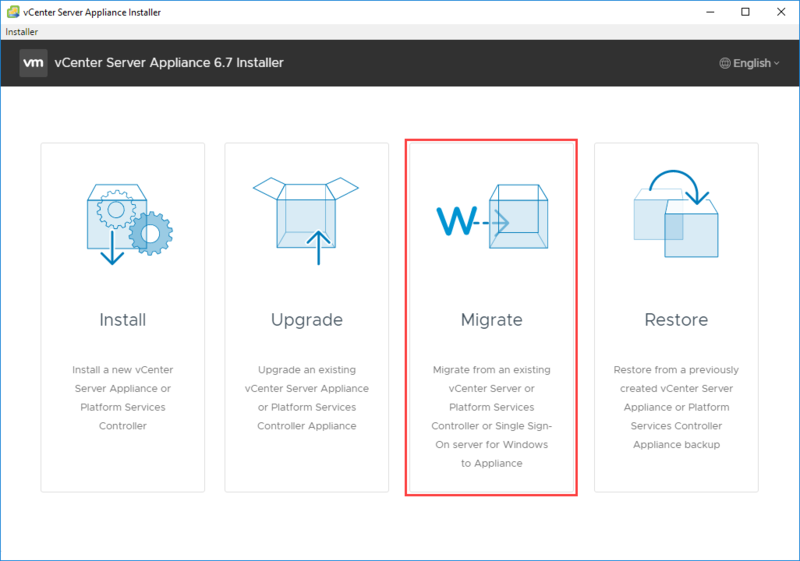 When moving from 6.0 or 6.5 to 6.7, my understanding is that the wizard will essentially be replacing your VCSA under the covers, migrating all your data over, then removing the old VCSA only if the migration succeeds. 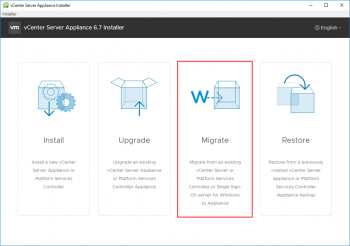 When moving from 6.0 to 6.5 or 6.7, it's a move form SuSE to Photon OS, which is much more svelte, reboots a lot faster, and is now even faster on 6.7 than it was on 6.5, see Introducing VMware vSphere 6.7! then explore that mounted drive to find your way to the installer. 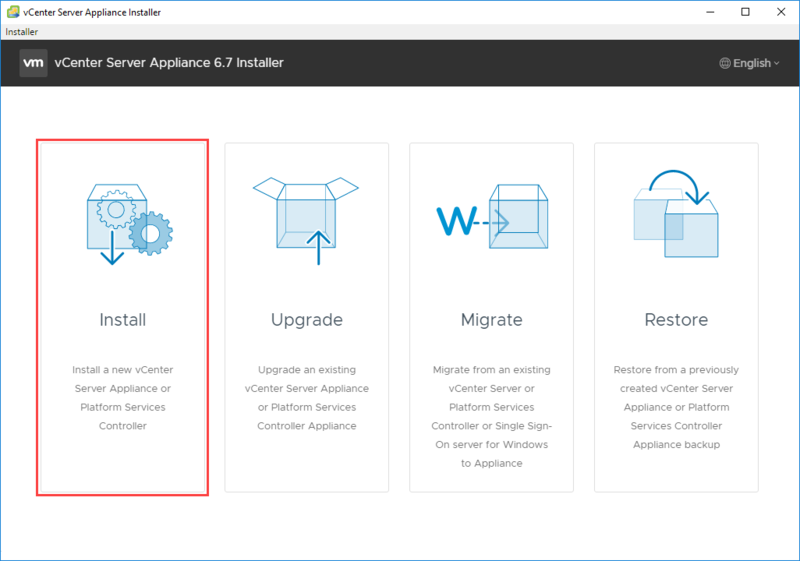 Here's the path to the Windows installer, but note that there are Mac and Linux versions too! I'm still working on testing this upgrade method, basically you walk through the wizard and answer the questions, which tends to be straight-forward if you have proper DNS including FQDN and reverse lookups. 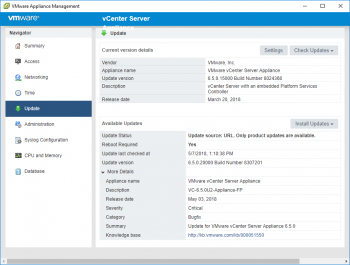 These type of upgrades or updates are out of scope for this easy update article, see also Emad Younis' excellent work at vCenter Server 6.7 What’s New Rundown and Introducing vCenter Server 6.7. Once you've finished the upgrade, your VAMI UI will show you're at 6.7.0.10000 Build Number 8217866. Isn't it lovely? 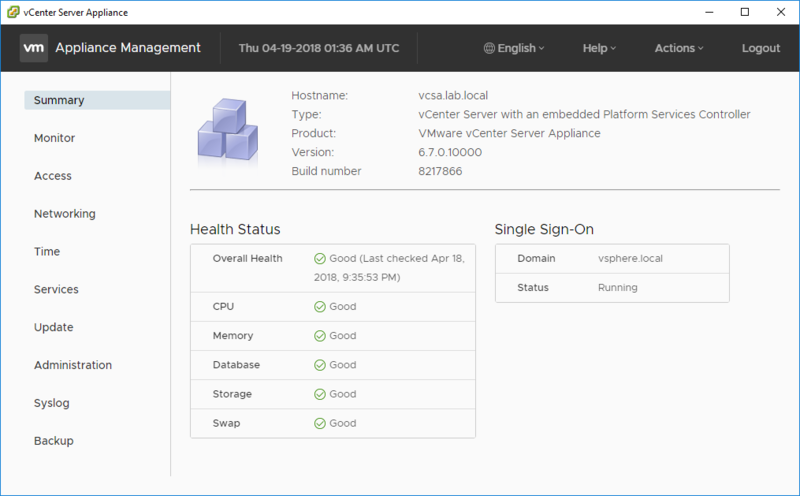 This is the new VCSA VAMI look-and-feel, courtesy of VMware adopting the Clarity UI. 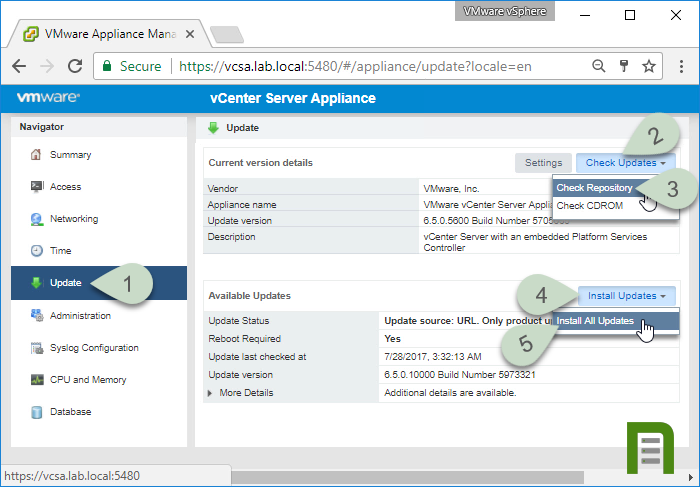 How to easily update your VMware vCenter Server Appliance from 6.5.x to 6.5 Update 1g [VCSA 6.5 U1g]. This same exact process isn't available for 6.7 yet, still investigating. Back on Tue Apr 17 2018, I received this error when trying to Check Updates. 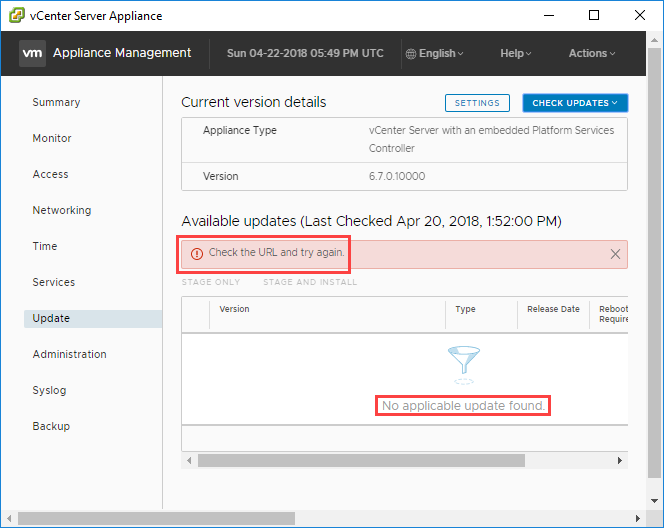 The error is now appropriate, there are no updates to install for 6.5.0.15000 Build Number 8024368, when checking for updates again on Sun Apr 22 2018. Note that it does not offer 6.7. This message is generated when the vCenter Server Appliance searches for and fails to find a patch or update. No functionality is impacted by this issue. 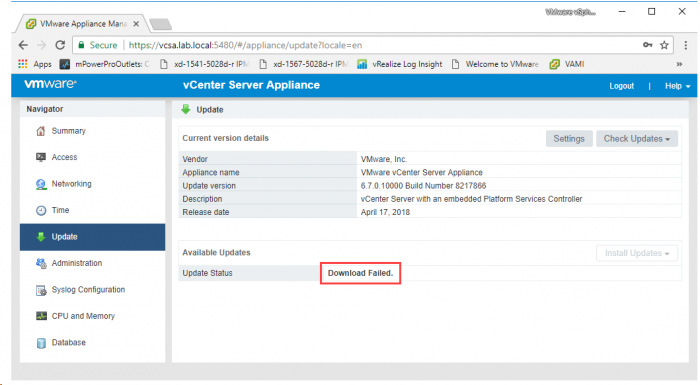 This issue will be resolved with the release of the first patch for vSphere 6.7. Workaround: None. No functionality is impacted by this issue. I'm not finding the 6.5 "Download Failed." error documented, and I realize many folks have the TLDR attitude and will go ahead and try the update button anyway. I also noticed that the 6.7 "No applicable update found." error is missing from the 6.7 release notes, so I've added it here as well. I have also reported these warnings internally at VMware, as have others. Despite these odd warnings, it appears you can proceed with the Upgrade using VCSA ISO file's Win/Mac/Linux installer featuring a friendly wizard, so these current online update issues are not show-stoppers. I've updated the article above accordingly. Update Status - Update source: URL. 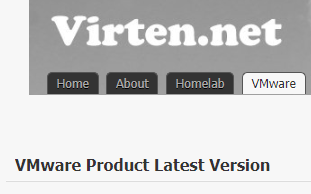 Only product updates are available. So it would seem that the easy update mechanism is for keeping a given major release current, such as keeping 6.5 patched/updated or 6.7 patched/updated. It does not seem to be for updating from 6.5 to 6.7, but gladly, that's not too hard either, for folks who have access to the VCSA download through either my.vmware.com VCSA ISO with trial or full license keys, and/or for VMUG Advantage EVALExperience subscribers. Not getting this article finished has unfortunately frustrated some readers, evident in klutch14u's comment below.